ASTM D412 is the most common standard for determining the tensile properties of vulcanized (thermoset) rubber and thermoplastic elastomers. Compounds in this family are used to create a vast array of consumer goods such as tires, footballs, and rubber bands. This family also produces highly specialized materials, such as O-rings on space shuttles, which must perform reliably under extreme environmental conditions. This guide is designed to introduce you to the basic elements of an ASTM D412 tensile test, and will provide an overview of the materials testing equipment, software, and samples needed. However, anyone planning to conduct ASTM D412 testing should not consider this guide an adequate substitute for reading the full standard. Tensile strength – the maximum tensile stress applied in stretching a specimen to rupture. Tensile stress at a given elongation – the stress required to stretch the uniform cross-section of a test specimen to a given elongation. 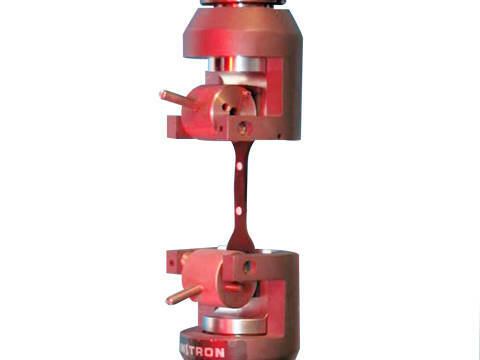 Ultimate elongation – the elongation at which rupture occurs in the application of continued tensile stress. Tensile set – the extension remaining after a specimen has been stretched and allowed to retract in a specified manner, expressed as a percentage of the original length. Please note that ASTM D412 does not apply to testing hard, low-elongation elastomers such as ebonite. Those needing to test ebonite and hard plastics should refer to ASTM D638. Most ASTM D412 testing is performed on a tabletop universal testing machine with a variety of accessories that can be configured to properly perform an ASTM D412 tension strength test for elastomers and rubber. A standard package would include a 3300 Series test system, an XL long travel extensometer, and a pair of manual roller grips. This system is excellent for small-to-midsize elastomer manufacturing companies, or for those buying their first D412 system. A more advanced and efficient system is the 5900 Series test system with an AVE 2 non-contacting video extensometer and a pair of 2712 Series pneumatic side action grips with an advanced air kit. This system is the world standard for tire manufacturers and large multinational elastomer manufacturers. For customers that demand high throughput, Instron's multi-station testing systems are the answer and can test as many as five samples simultaneously. ASTM D412 describes two methods for testing, depending on specimen type. Please be aware that these two testing methods do not produce identical results. Test Method A makes use of “dumbbell” or “dogbone” shaped specimens, while test Method B is designed for ring-shaped specimens. Test Method A is more commonly used than Test Method B. Dogbone specimens must be die cut from an injection molded sheet or plaque. The direction in which the sheet is extruded is important as it produces a subtle grain pattern in the material. For the most accurate results, half the specimens should be cut against this grain, and the other half should be cut with it. There are six allowable types of dogbone specimens for ASTM D412 testing and two allowable types of cut ring specimens. The most commonly tested shape is a die cut C dogbone specimen, which calls for an overall length of 115 mm (the gauge length being 25 mm), width of 6 mm, and thickness of 3 mm. Thickness of the specimen must be measured three times, with the median value being the accepted value. To ensure conformance with the standard, all specimens used for ASTM D412 testing must be measured with a micrometer in accordance with ASTM D3767. The Automatic Specimen Measuring Device feature in Bluehill® Universal allows operators to connect up to two micrometers or measurement devices to the computer and input the data directly into the software. This eliminates the chances of operator input errors and increases efficiency. In order to test properly, specimens must be held perpendicular to the jaw faces and not tilted on an angle. Specimen misalignment can cause major variations in test results, and proper care should be taken to ensure that the specimens are all aligned consistently for each test. One way of addressing misalignment is by using a jaw face that is close to the same width as the specimen, making it relatively easy to visually adjust alignment. The easiest way to prevent misalignment is to use a specimen alignment device which mounts directly onto the grip bodies. This is a simple bar that provides an adjustable stopping point so operators can easily see that their specimen has been aligned correctly. Once grips are tightened onto the plastic specimens in preparation for running a test, unwanted compressive forces are frequently applied. These forces, although minute, can interfere with test results if not treated properly. It is important that they not be balanced after the specimen is inserted, as this will cause an offset in results. Bluehill Universal materials testing software can be programmed to normalize forces across multiple specimens and remove any slack or compressive force, ensuring consistent results between specimens. Specimen Protect, which is available on the 5900 Series universal testing machines, is designed to prevent damage to the specimen or system during the set-up phase of a test, before a test’s operational limits are defined. When turned on, Specimen Protect automatically adjusts the crosshead to keep any unwanted forces under a certain limit. As elastomer samples stretch, their thickness decreases. For this reason, ASTM D412 recommends grips that tighten automatically. A consistent and uniform pressure across the jaw faces ensures that thinning samples do not slip out of the grips during testing. Side action pneumatic grips with serrated faces are highly effective for testing elastomers. With pneumatic grips, the inlet air pressure adjusts automatically, enabling the gripping force to remain constant even if the specimen thickness changes significantly during a test. Another effective option is to use self-tightening roller grips, which use a spring to put constant pressure on the sample during testing. For those using ASTM D12 test Method B, O-ring specimens can be tested with our O-Ring Fixture. These grips prevent local stress concentrations by using rotating shafts on the upper and lower fixtures. Although extensometers are not required by the standard, a strain measurement is recommended for the most accurate and repeatable results. Strain measurement based on crosshead travel can be less accurate due to elongation of the specimen outside the gauge length. The XL Long Travel extensometers are designed to work for elastomeric materials and can also be used through specimen break. The adjustable clamping force on the knife edges reduces premature failure of the specimen. This extensometer can measure strain up to 3,000% from a gauge length of only one inch. A non-contacting extensometer like the Standard or Advanced Video Extensometer 2 (SVE 2 or AVE 2) is the most ideal for elastomeric materials. It is especially suited for specimens that are fragile or require an environmental chamber for testing. Non-contacting video extensometers offer the added benefit of reducing results variance due to operator interference and increasing efficiency in labs with high throughput needs. Elastomers tested under ASTM D412 are often destined for future use under non-ambient conditions. 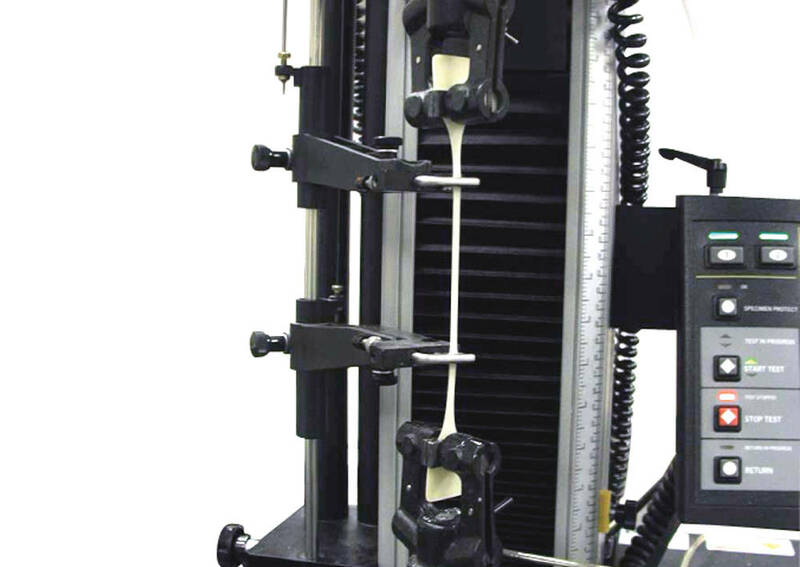 Because ambient conditions have a great impact on the tensile properties of elastomers, care must be taken to ensure that test conditions mimic those of the intended end-use application. Test speed, temperature, humidity, specimen dimensions, and pretest conditions all have notable effects on test results and must be controlled in order for the test to produce useful data. To ensure that these elements simulate the material's end-use application, ASTM D412 is frequently performed inside an environmental chamber where heating or cooling (LN2 or CO2) can be used. Instron's 600 Series environmental chambers enable operators to monitor the temperature inside the chamber throughout the duration of the test. In addition, soaking time and temperature can be set up within Bluehill Universal to ensure that all specimens are conditioned appropriately before the start of the test. For labs looking to increase their throughput, several modifications to the system setup can be made. Automatic specimen measuring devices, pneumatic grips, and specimen alignment devices all increase test efficiency by reducing the amount of manual input needed from the test operator. However, testing time for ASTM D412 depends on the expected elongation of the specimen and cannot be minimized. For materials with high ductility, the duration of the test consumes the majority of the overall test cycle. In these cases, multi-station test frames may provide the best throughput because the operator can run up to 5 tests simultaneously. Fully automated test systems are also available and are designed to incorporate specimen measurement, specimen loading, testing, and removal. These systems can run for hours without requiring any operator interaction. In addition, these systems help reduce variability due to human error.